On the last issue, we talked about what planets could be colonized while in outer space. We also talked about why specifically Mars is the best planet, starting off because as of now, Mars is the most habitable planet in our solar system due to its similarities to Earth. On this article, we will be talking about what materials could be used for architecture in space. We will also be looking at how some of the best projects introduced by architecture firms have used materials known to us to construct their dwellings in outer space. One day, hopefully not so far away from today, we will leave the planet Earth to find a new home in space. When we make the move however, we will have had to think about the materiality that is going to be making up our structures and dwellings. Things that make "ours homes" the galactic habitat we always thought of. What type of material protects us from radiation and flying meteors? The cost of transporting raw materials into Space is prohibitive – potentially US$2 million for a single brick to be shipped to the Moon. This means that the future of extraterrestrial construction rests on the development of technologies that are able to employ in-site materials, such as lunar dust. Neil Leach is a NASA Innovative Advanced Concepts Fellow, collaborating with colleagues from the University of Southern California (USC) on a research project developing a robotic fabrication technology capable of printing structures on the Moon and Mars. He describes how 3D printed fabrication technologies can revolutionize design in outer space. Given the cost of delivering the materials to space, we must make the most out of the materials found on site. He states that in terms of printing in the moon, the natural choice of material is lunar regolith, which is a fine graphite-like substance that coats the Moon's surface. The Moon could also be mined, because there are more deposits of it on its core. But how can we print 3D-printed parts with such a small printer? I am sure everyone has seen the MakerBots, the most known 3D printers out there, which are about 8 inches wide and deep. The most recent technology for printed larger parts is the D-Shape. 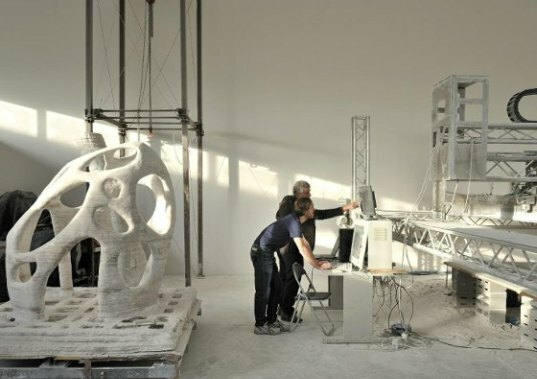 The D-Shape is a large 3D printer that used binder-jetting, a layer by layer printing process, to bind sand with an inorganic seawater. The inventor, Enrico Dini has experimented with epoxy resins and other forms of stone dust or powder. So it is possible to use lunar powder or stones in Mars to 3D print these technologies. One of the advantages of D-Shape is that it prints on a bed of regolith that serves to support whatever structure is being printed. This allows shallow arches to be printed. By contrast, one of the disadvantages is that its ink needs to be transported from Earth, which would be costly, despite attempts to reduce the amount of printing using honeycomb construction that maintains the effective depth of the structural system while reducing the mass involved. NASA recently awarded three teams/architecture firms for a first stage 3D printed competition to build 3D printed habitats. The design competition challenged participants to develop architectural concepts that take advantage of the unique capabilities 3-D printing offers to imagine what habitats on Mars might look like using this technology and in-situ resources. One of the finalists for NASA's 3D habitat competition was Foster + Partners from New York. Their design outlines plans for a settlement on Mars constructed by an array of pre-programmed, semi-autonomous robots prior to the eventual arrival of the astronauts. 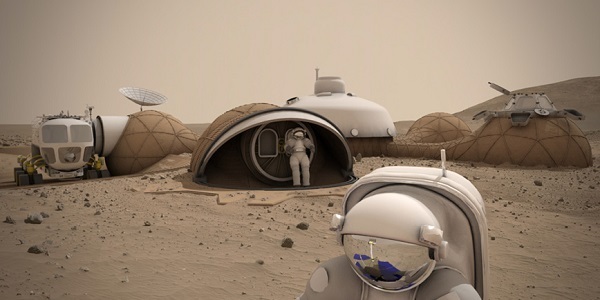 They envision a robust 3D-printed dwelling for up to four astronauts constructed using regolith – the loose soil and rocks found on the surface of Mars. In their words, "the habitat will be delivered in two stages prior to the arrival of the astronauts. First, the semiautonomous robots select the site and dig a 1.5 metre deep crater, followed by a second delivery of the inflatable modules which sit within the crater to form the core of the settlement." Basically, the deployment and construction is designed to take place with minimal human input, it will all be undertaken by robots. Robots parachuting to the surface of Mars. Three different kinds of robots are parachuted to the surface of Mars, each performing a specialised task within the large-scale Regolith Additive Construction (RAC) process. One of the robots is the "digger" which create the crater by excavating the regolith. The "transporters" move into position over the inflatable habitat modules layer by layer. Then, the loose Martian soil which is excavated will be used for 3D printing by "melters." The fused regolith creates a permanent shield that protects the settlement from excessive radiation and extreme outside temperatures. The compact modules finished with soft materials. The first-place award was given to Team Space Exploration Architecture and Clouds Architecture Office of New York for their design, Mars Ice House. Why Ice? Water ice is an effective radiation shield, which diminishes both-ultraviolet solar and galactic gamma rays to safe levels. Ice is translucent and it allows to see natural daylight. Water ice is abundant in the northern latitudes and easily extracted as it's covered by only 30cm of loose regolith. It takes less energy to process and print with water, since the natural climatic and atmospheric conditions (below freezing with low humidity) allow us to take advantage of the physics of phase transition. Another type of 3D printing which could be done on Mars is "lava-casting." The team, LavaHive is a modular 3D-printed Mars habitat using a novel construction technique called ‘lava-casting’. The habitat is made up of one inflatable dome brought from Earth, for critical crew areas, connected to a series of smaller domes, housing laboratory space and working areas. LavaHive incorporates recycled components as a key element of the habitat concept, including a re-used part of the entry vehicle acting as the inflatable habitat roof. First, the idea is for the molten regolith foundation to be put into the 3D printers, then add various regolith layers to create dome-like dwellings made from Mars' regolith surface. The basic idea is to heat sulphur to about 240 °C so that it becomes liquid, mix it with Martian soil, which acts as an aggregate, and then let it cool. The sulphur solidifies, binding the aggregate and creating concrete. And there you have it, Martian concrete. And with these last images, we end our first research series, Creating Architecture in Space. We have analyzed how the body functions in outer space, what can happen to us in a year if we would live in a different planet. We have also talked about what planets are the next to be colonized, it included the Moon and Mars. The moon, because it is very close to Earth and although it has no atmosphere has been found to have several things that astronauts can use to live in such as lunar soil. Mars is the best option, since it has many similarities to Earth, such as the days which are the same in length, the atmosphere is similar and has water and ice. After that, we talked about NASA, who is sending people to space for long missions. We then talked about what materials exactly could be used to build structures and architecture on Mars and on the Moon. We looked at several examples from the finalists to NASA's competition about designing 3D printed habitats. Why 3D printing? Because it is the easiest and most cost-effective way to build on another planet. Sending materials from Earth would cost too much, and we need technology to help us build our future in other planets. We looked at how 3D printing could be used with many materials, such as ice, lava (molten Martian rock), and Martian regolith powder that can be used by robots to create dwellings.